Three people have been killed and at least 62 others wounded in two explosions on passenger buses in the Kenyan capital Nairobi, officials say. 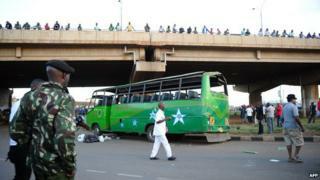 Both blasts went off on Thika road, a busy highway north-east of the city. The buses were crowded at the time of the explosions, which police said were caused by improvised devices. Sunday's attack was the second in Kenya in as many days. Recent violence has been blamed by the government on Somali Islamist group al-Shabab. According to reports, the two explosions went off outside a hotel and at an underpass not far from Kasarani, north-east of the capital. Kenya's National Disaster Operations Centre said 20 of those wounded were in a critical condition. The buses were badly damaged by the explosions. Television footage showed a gaping hole in one, while the doors and windows were blown out of the other. On Saturday, a grenade was thrown in a bus in the coastal city of Mombasa leaving four people dead and another 15 wounded. The bus had just travelled from Nairobi. There was a second blast near a beach-front hotel, but no-one was hurt. The al-Qaeda-linked group al-Shabab has launched a series of attacks against Kenyan targets in recent years in retaliation for Kenya's military involvement in Somalia since 2011. In September, at least 67 people were killed when al-Shabab fighters seized the upmarket Westgate shopping mall in Nairobi for four days.